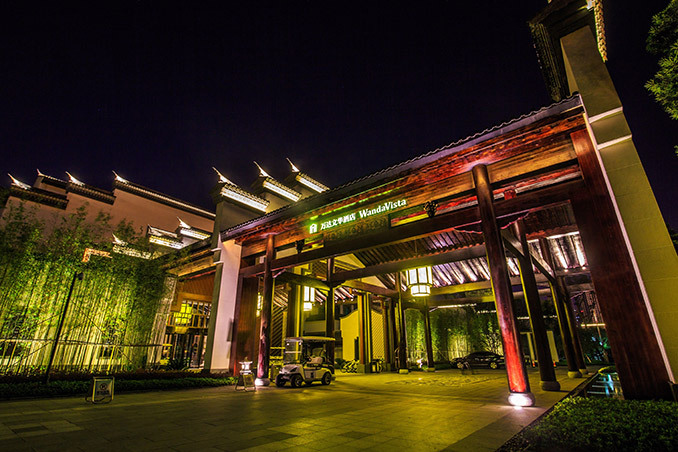 The core concept of Wanda Vista Hefei is to create cultural tourism products with local characteristics. 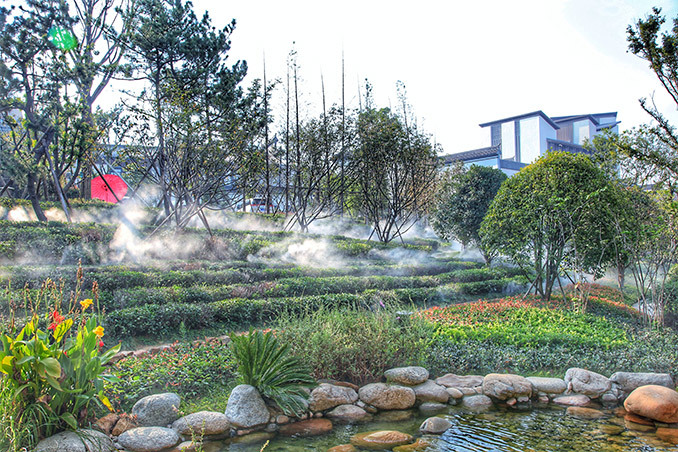 In respect of the local ecological environment as well as heritage of local context, according to local unique Chaohu wetland natural condition and human resources in Huizhou, the landscape design of Wanda Vista Hefei brings Huishang culture(representative in local), legends, architectural features, and material technology into available resources of landscape design. 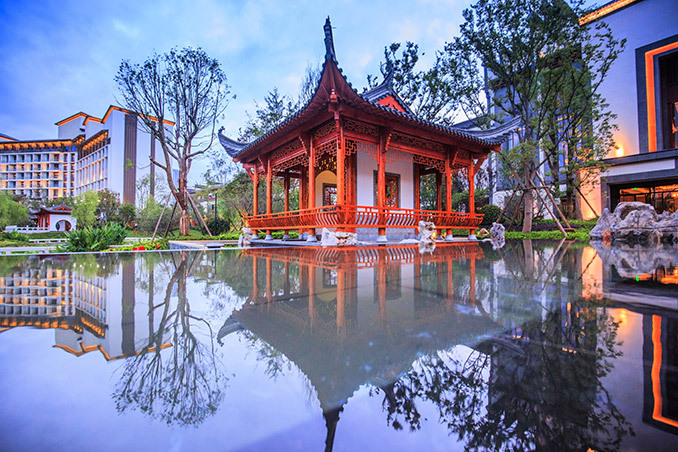 By means of profound cultural digging and spacial planning of art, it created a hotel landscape with the theme of “having a deep affinity to hometown and returning to Huizhou in dream”. 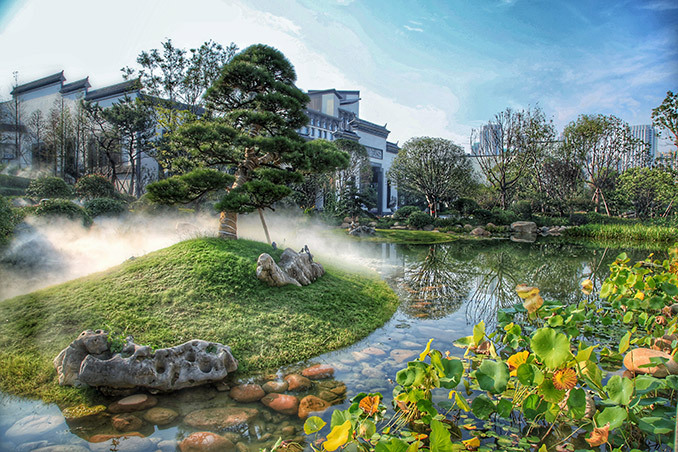 Located near the Chaohu, the landscape design of Wanda Vista Hefei respects local history context and refines its unique Regional humanistic culture like Number One Scholar returning to hometown and Huishang accomplishing their tasks,interpreting a knot song of Huizhou people to pursue dream and get it, to miss home and watch over it. 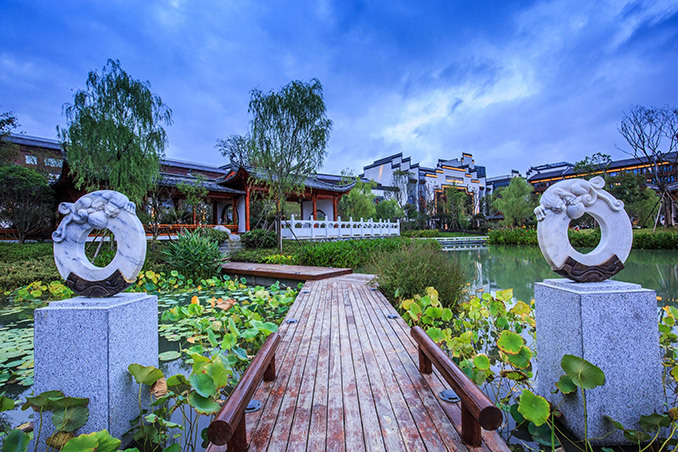 For the expression of landscape,Wanda Vista Hefei mixes elements of Hui style architecture into it and reserves the design skills of garden of traditional Huizhou. 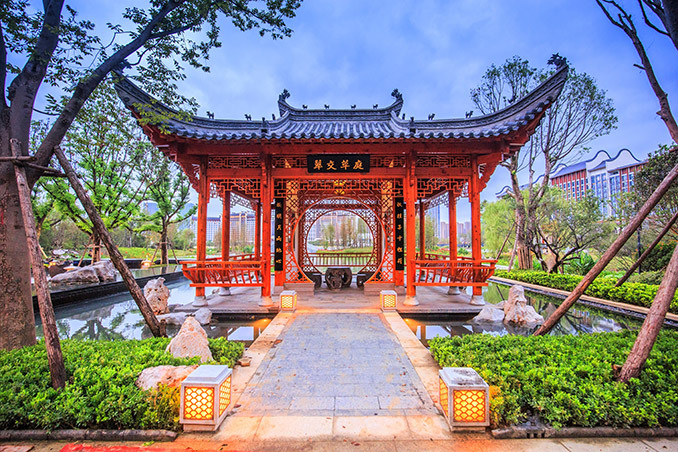 Classical elements of Hui style like whitewashed wall, gray tiles, bridges with moon-like hole, lunar palus, green waves and tile carving, are all involved in our landscape, giving a feeling of ancient Huizhou and listening to an ancient Huizhou song. 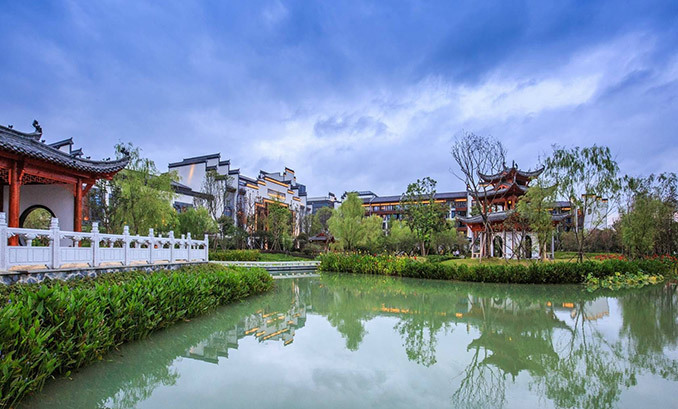 When refining unique regional culture of Huizhou, hotel management of Wanda Commercial Planning joint Group and the design team have decided three themes for Wanda Vista Hefei–welcome luck, achieve dream and elegant residence. Welcome luck means that when Huizhou decoy return home, all relatives and friends meet him in front of the gate. Achieve dream stands that overlooking the painting bridge in watching platform, express family’s miss of those far away from home and their good intention to reunion. Elegant residence is to create beauty of leisure, nature, unrestrained, elegance and tranquility as well as a haunting place. 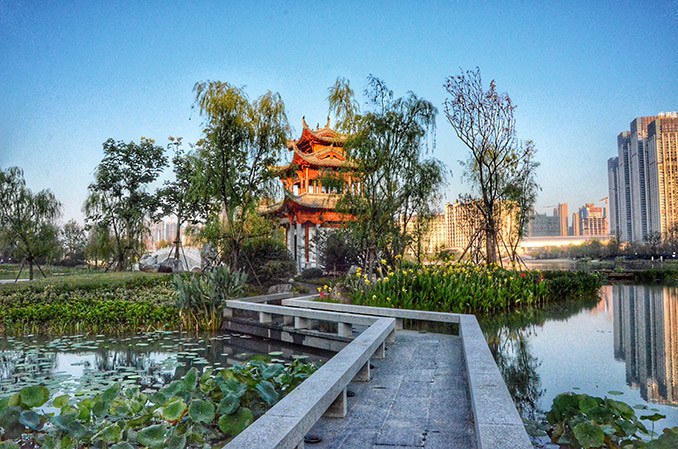 After the decision of general theme, Wanda Vista Hefei first combines large lakes and conform to green ecology in the overall design of the project, building an ecological environment with integration of greenery and waterscape, by means of careful operation of architectural form and landscape orientation.The entire landscape program has great breakthrough in the functional layout, ecological philosophy and respect for local culture. 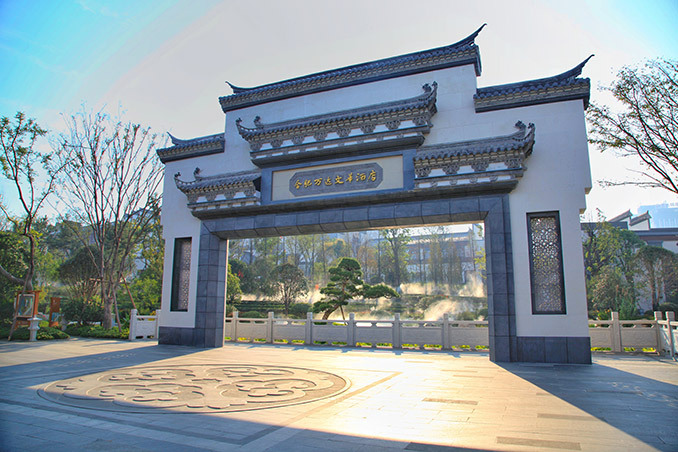 It selects classic architecture of Hui style like wharf wall, white walls and gray tiles. 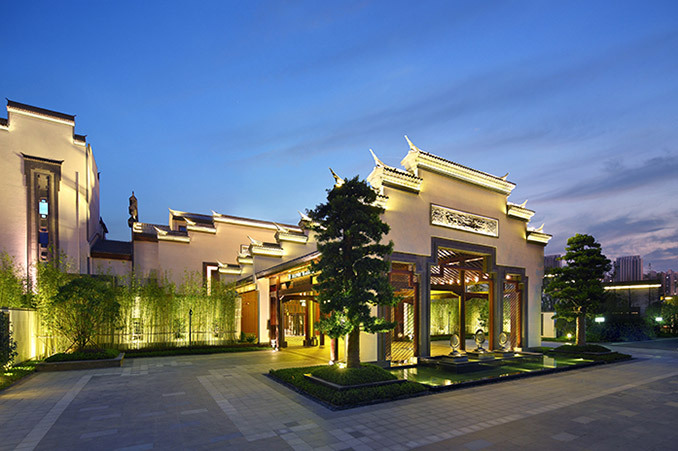 Coleman pillars gives the user vivid impression of Huizhou, and also reflects the respect and elegance of hotel culture. 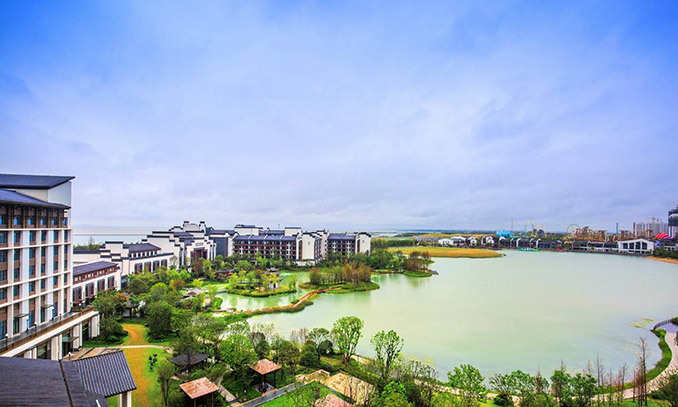 Wanda Vista Hefei obtains its inspiration from pastoral natural features of Huizhou and then creates a unique landscape environment with combination of pastoral and wetland. 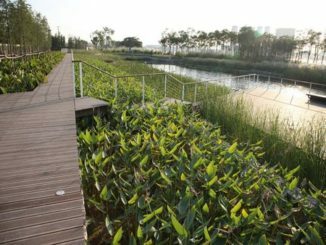 Its landscape around the lake takes wetland as the main body and highlights features of natural ecology, water-interaction courtyard and wetland landscape. Building design adopts lower houses, giving consideration to both lake view inside courtyard, stressing the privacy and respect of the environment. In addition, in this design, part terrain is elevated, forming a new one that strewn at random, which is not only far away from the cities’ noise, but also can obtain better view. More importantly, it introduces buddhist mood, creating new landscape of Hui style. To build a successful resort hotel, we must respect the local natural landscape, cultural background, focus on the site and construction, and even the details of the design will all be the necessary conditions to create a rich landscape experience space. 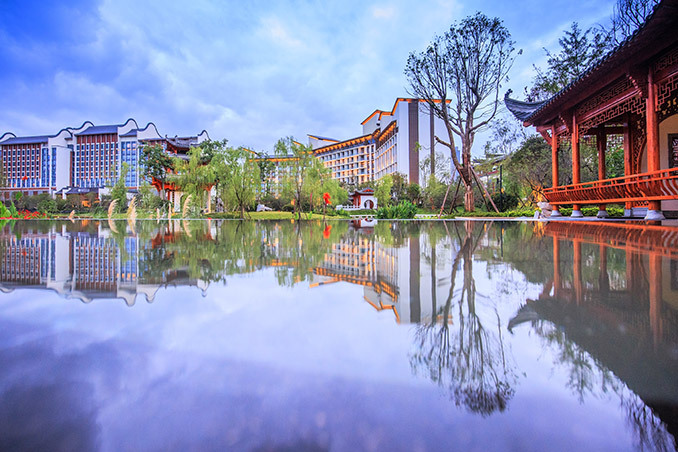 Only the organic integration of resort hotel’s landscape planning and culture, can we change the external, visible and visible cultural symbols into the inner, invisible, and unique cultural landscape,creating a cultural atmosphere being born again and again and achieving product innovation and application of cultural elements of Wanda Vista Hefei.